A small California town is under mandatory evacuation as a huge wild fire threatens its citizens, their homes, and the surrounding forest. Just as the family is about to leave, their unsuspecting dogs Loony and Max are tricked by Prince, the evil cat. Following the cat’s sinister advice, the sweet but gullible dogs disappear to avoid the vet and to find the barbecue sausages, leaving the family no choice but to drive off without them. 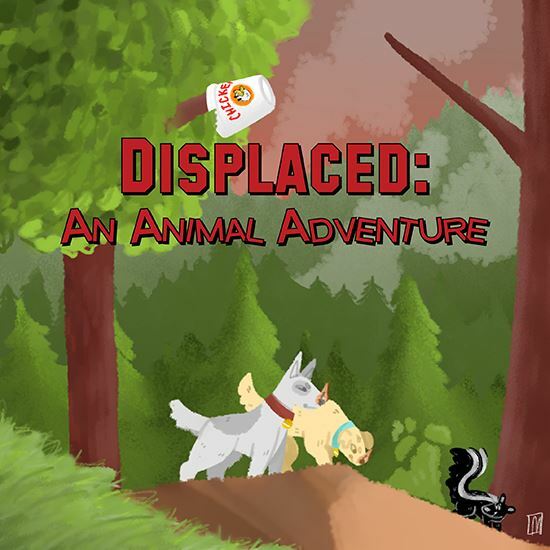 During their big adventure to find their family again, the dogs journey through the forest where they encounter pushy raccoons and hungry coyotes. Luckily, they are joined by the most unlikely hero, Samuel S. Skunk. Will these good dogs, who have never been outside without their humans, escape the fire and be reunited with their family? About 40 minutes. On Sunday July 15th, 2018, a small fire started near Lake McClure in Mariposa County. Mariposa is a small mountain town just outside of Yosemite National Park where I teach high school. We have under 500 students for the entire county and not even one stoplight. As the fire spread, thousands of families were evacuated from Cathey’s Valley, the actual town of Mariposa, and many other neighborhoods throughout the county. When it was all said and done the fire burned over 80,000 acres and 63 homes were destroyed. Many of my students faced this new school year without a home. This is a play about a specific place, so I have included a map to show you the area; feel free to include it in your program if you feel that is necessary. Some of the names of places and businesses have been changed to protect the anonymity of the townsfolk. To learn more about the Mariposa County Drama Department see this video.